On Sunday, August 7th during the preliminaries for the 100m women’s backstroke, American swimmer (silver medalist) Kathleen Baker lost one of her signature pearl earrings to Rio’s Olympic pool, the depths of which reach almost ten feet. Thankfully, a diver went down to search for the earrings, and ultimately recovered it from Baker’s lane around the 15 meter mark. The story has a happy ending, but it does bring up a few cautions for anyone who wears their jewelry swimming or who may be thinking of adopting some good luck swimming pearls of their own. The most obvious thing to consider is that jewelry can and will fall off. Earrings, necklaces, bracelets, and rings all have ways of finding themselves falling to the bottom of pools, lakes, rivers, and oceans all over the world. If you're lucky you will find them again, but more often the pieces are gone for good. Now you may say "but I can lose my jewelry on dry land as well!" I would agree with you, but there is a less obvious but possibly even more serious concern when it comes to swimming in jewelry. Both natural and cultured pearls are covered in a luminous substance called nacre. In natural pearls this layer has built up over an immense amount of time and is incredibly thick (hence their high cost and relative rarity), in the more common cultured pearl the nacre present on the surface of the seed material (see image). The nacre contains some organic proteins and also calcium carbonate. Calcium carbonate dissolves when it comes into contact with acid. Even mild acids (perfumes, lotions, hairspray, and makeup) can weaken the structure of the pearl’s nacre and eventually dissolve its beautiful shine. The chlorine used to purify water is actually sodium hypochlorite, the same stuff you find in household bleach. This particular type of chlorine is highly oxidizing, and has a tendency to destroy a pearl’s luster on contact. Over time the pearl's nacre will come off, leaving a cloudy surface; it may even peal off in layers while the inside continues to disintegrate (it's not pretty, trust me). So while all that is happening to your pearls, your metal is going through an equal amount of hardship. Chlorine can react with precious metals, including gold and silver. If you’re in the pool every day or cleaning with bleach products it can cause pits in the gold’s surface that look like little dents. Chlorine can actually break down gold jewelry to the point of disintegration. A gold ring, placed in undiluted bleach, can disintegrate within minutes of exposure. Stress corrosion cracking can also occur in any weak joints of the jewelry or areas where it has been repaired. In general, platinum doesn’t react with chlorinated pool water, but some platinum rings contain gold solder that can. But I have to wear it! If you absolutely must wear jewelry in the pool then the best metallic material to wear is stainless steel, specifically type 316 stainless steel, which is resistant to chloride attacks from sweat and sea water. Titanium alloys also stand up well. If you are firmly on board the pearls-in-the-pool train then I suggest imitation pearls. There are various types of imitation pearls from plastic, to glass, or shell. The relative inexpensive nature of the imitations means your heart and your wallet wont break when an earring is lost or dissolved in the pool. No matter what your jewelry’s made of, one thing is certain: all of that sweat and chlorine will dull its brilliance, so make sure to clean it. Most colored gems can be cleaned in warm water with mild soap and a soft brush. Precious metals should be cleaned similarly. When in doubt about cleaning jewelry make sure you ask! Gemologists are here to help. I some exciting news. I have started a YouTube channel. I already have a video review of a really exciting photo product up and ready for you to check out! Autumn is a time for fall leaves, and (if you're into them) pumpkin spice lattes. It is also a time to cuddle up on cold gray rainy days. The change in temperatures bring a change in fashion. Darker neutrals appear, soft grays and blacks keep us warm on the darkening days. Punches of color that match the changing leaves are obvious choices to spice up a wardrobe; less obvious are the colors that match those rainy days and evoke the "cuddle up" feeling. Teal stones can add subtle color without overpowering a neutral outfit. Apatite is relatively unused in most mainstream jewelry. It can have a unique teal color that ranges from a bluer to greener tone. With a Mohs hardness, of 5 it is not the best choice for a ring, but it is well suited for other jewelry that takes less daily abuse. Matched sets of apatite can be difficult to find; however, this leaves a great opportunity for necklaces or unique accent stones in earrings. If you like a stronger blue with a moody edge "London blue" topaz might be your stone. Unlike Apatite its hardness of 8 makes it an excellent choice for any type of jewelry. It is also a very affordable stone, even in larger sizes. Larger stones can make for wonderful statement rings. Blue zircon can have a teal-like hue in darker colors that sometimes exhibits a greenish hue when viewed at certain angles. Blue zircon is the most popular zircon color. Zircon has another distinction that can make it stand apart from other stones, it has an extremely high refractive index, which gives it great fire and brilliance. This makes it similar to a diamond and a great alternative to a diamond of the same color. Irradiated blue diamond can also come in a teal color, but are generally available (and affordable) only in small sizes. Gray gemstones are often very overlooked. This is perhaps because there are not many faceted gray gemstones that are popular in mainstream jewelry, but gray stones have much to offer. In particular, cabochons and beads in these unique and often affordable stones can make you stand out from the crowd. Starting off the list of faceted gray gemstones is spinel. Spinel can often have a grayish, grayish-violet, grayish-blue or grayish-pink color. The are also usually untreated and affordable gems in these colors. The hardness of 7.5-8 makes these excellent stones for all jewelry types. One of my personal favorites when it comes to gray stones is gray sapphires, which often have an appealing violet undertone. They are however, rare and rarely used in jewelry. If you can manage to find one, they are wonderful stones. With a hardness of 9 they are excellent for use in all jewelry and because gray is considered an ‘undesirable’ color in sapphires the prices can be relatively low. Many of the grey cabochon cut stones are also available in bead form and offer a lot in the way of variety of looks. Hematite cabochons have a striking gun-metal gray color, with a metallic luster. They are also available in almost every shape and size at an affordable cost. This can be a beautiful choice for the transition from the warmer months. 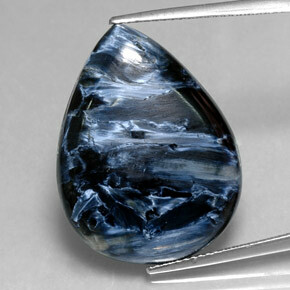 Another well known cabochon choice is Labradorite. It has a lighter gray body color with a beautiful iridescence, known as "labradorescence". Colors of blue, violet and gold dance on the surface of the gem adding a subtle hint of color. Moonstone is yet another beautiful choice. Moonstone can range from a milky white, to peach, to clear with a flash of blue, to gray. The soft colors evoke the look of cozy sweaters and soft cashmere scarves. Other choices include the swirling grays of Botswanna agate, snowflake obsidian, and gray veined howlite. If you are adventurous there are gray cabochons that are not as well known such as pietersite, which can have a gray to midnight blue body color with silky luster. Seraphinite is also a relative unknown to the general public. The stone, which tends to be greenish-gray, has soft, feathery silver fibers. Pearls are a popular choice for gray jewelry. They are available in various price ranges as well as many shades of gray, from pale to dark, bluish- or greenish-gray South Sea pearls. Smooth, blemish-free, symmetrical pearls with sharp, bright reflections are the most highly-prized. Misshapen (called "baroque") pearls can offer the wearer more unique looks and designs than standard spherical pearls. It wouldn't be right to not mention the stunning gemstones that are October's birthstones in this list as well. Tourmaline comes in a rainbow of colors to fit the wearer's desires, including moody teal-ish blues like indicolite as well as a darker steely gray. Likewise opal comes in a variety of body colors with various other colors dancing on the surface. Both of these stones come in a variety of price ranges and could be the perfect accent to a fall wardrobe. This list is by no means exhaustive. There are so many gemstones that it would be nearly impossible to list them all, but I do hope that this has inspired you to take time to explore off the "beaten path" of gemstones. Happy fall! The secrets that the earth holds are slowly being revealed to us day by day. One of the more recent discoveries is a rare African plant that can indicate the presence of diamonds beneath the soil. Pandanus candelabrum seems to only grow on kimberlite pipes. This has geologists and mining companies interested because the presence of kimberlite can indicate the presence of diamonds. The thorny, palmlike plant was recently discovered in Liberia by geologists. The plant, Pendanus candelabrum, has a “marked affinity for kimberlite pipes,” writes Stephen E. Haggerty, a research professor in geosciences at Florida International University, in the June–July edition of the journal Economic Geology. Traditionally a variety of indicator minerals are used to find kimberlite pipes. Those minerals then have to be tested by labs. But if the plant is as choosy as it seems to be, explorers could possibly track a plant from the air and diamond hunters in West Africa might have an indicator that can eventually lead to easier, less expensive diamond exploration. Using plants as indicators is not a unique or even modern tactic, as Haggerty’s paper notes, plants have been used since medieval times. For example, Lychnis alpina, a small pink-flowering plant in Scandinavia, and Haumaniastrum katangense, a white-flowered shrub in central Africa, are both associated with copper. That’s because the plants are especially tolerant to copper that has eroded into soil. One major caveat to the idea of the "diamond plant" is that Pendanus candelabrum is only found in tropical areas, and diamonds are not. Indeed a world-class mines have been discovered in bitter-cold regions in Siberia and Canada. However Haggerty can also see that the new discovery might pave the way toward finding new botanical indicators for kimberlites. “Because of the depths at which kimberlites originate, it doesn’t take a rocket scientist to see that their chemistry has to be different from the surrounding rocks,” he says. On a final note, while this discovery is influential it should also be said that just because one might find a kimberlite pipe, it does not mean there will be a diamond mine. Only 1 percent of kimberlite pipe discoveries result in economically viable diamond mines. I am a big fan of Kickstarter. Crowd-funding can lead to all sorts of products being produced that would never would have seen the light of day by other means. Kickstarter has especially influenced the wearable technology industry. The Galatea follows in the same vein as wearable technology; however, there is a key difference. Where most wearables focus on utility, the Momento Pearl focuses on sentiment. The heart of the modern jewelry industry is essentially born out of sentiment and emotion. Coupled with the unique use of modern technology, Galatea has capitalized on these moments. An NFC chip embedded in a cultured pearl allows a message or a photo to be associated with the pearl. The photo or message can then be retrieved by tapping the pearl to “a sweet spot” on the back of an NFC enabled Android device. Sorry iOS users, the technology just isn’t there yet. The pearls are available in a variety of settings, as well as being available in the patented “Galatea pearl”, the only pearl grown with a gemstone (usually man-made opal) inside. Being a bit of a wearable technology junkie I just had to check this out for myself. I backed the project at the early bird stage so I paid $95.00 for a white carved "honeycomb" pattern pearl in 18k white gold. The expected retail price of the pearl jewelry is in the $400.00 range, but the exact retail scale of costs remains to be seen. As promised, the Momento Pearl arrived well in time for Mother's Day, which was brilliant timing on their part. It even contained a To: and From: postcard if the item was to become a gift! Before I even looked at the necklace I was struck by just how much material about the company and other products that Galatea offer accompanied the necklace. It is clear that this is being marketed towards the retail world even though they capitalized on the general public's support during their Kickstarter campaign. This was incredibly evident from the letter detailing extra products for customers and how to show your customers how to use the device. I set aside the catalogs for later because I was too excited to check out the pearl. As the Kickstarter promised, I received the necklace as well as a rubber bracelet that they said would help the user to locate the NFC chip in the back of their device. The pearl has an interesting look. I wasn't sure I would be a fan of the carved honeycomb pattern, but it does offer the wearer a unique look to their pearl jewelry and light does play off the "facets" when viewed closely. Included in the jewelry box with the necklace was a small scroll tied with a ribbon. This gives instructions for using the pearl in very easy to follow steps. The instructions for using the pearl and bracelet were very straight forward: simply touch the bracelet or the pearl to the back of the Android device and it opens up the Google Play (app) store. Install the free app and you are good to go. From then on touching the bracelet or pearl will open the app. Once the app is open you are given the choice to associate a voice recording, photo, website, or written message. I tried all of the options that were given to me on the app and all of them worked really well. It is easy to change the associated images. If the app is not associated with any of the choices it will take you directly to the Youtube advertisement for the Momento Pearl. I could easily see the Momento Pearl being popular for mothers, grandmothers, daughters, significant others etc. It reminds me very much of the recordable greeting cards, but with the added bonus of it not ending up in the trash soon after. "Imagine being able to say 'I Love You" repeating into eternity or being able to record your wedding vows in an anniversary gift worn close to the heart. With just a tap of your phone to this pearl you can listen to your children's laughter or see your loved one's face. The Momento Pearl requires no battery and no wire. Think of it as a digital locket for the 21st century. " The future of the popularity of the Momento Pearl remains to be seen, but the selling point of saving memories obviously appeals to a lot of the buying public. For now I see it as another step closer towards the marrying of technology and aesthetics, of incorporating sentimentality into what used to be a purely function based product group. My better half used the bracelet on the phone and lost his privileges thereafter. Be sure to check out this blog page as well as Jewelry News, and Product Review section for lots of fun new information! ©Suncrest Diamonds. Formerly brown diamonds now pink after HPHT treatment. But, I think the questions that most stick with me are the ones regarding treatments. Most often I get a question like “The salesperson offered me a diamond and then slipped in the word HPHT/clarity enhancement/irradiation/CVD. I didn’t know what that was so I decided to wait.” I generally commended them on waiting, because being informed is the best course a consumer can follow! Diamond treatments are perhaps the most confusing topic for consumers. Today I want to cover just one HPHT treatment. I am going to break it down by definition, impact on the industry and then what it means to you as the consumer. So without further ado let's dive in! Type IIa diamonds are the most chemically “pure” diamonds on earth containing few to know impurities. They make up approximately 1-2% of all diamonds and the majority are colorless. However as these diamonds are being pushed towards the surface of the earth they may pick up impurities that color the diamond, the most common color is brown. HPHT is a permanent treatment used specifically on brown type IIa diamonds subjecting them to enormous amounts of pressure and heat replicating the natural forces that create diamonds. By doing so a near-colorless to colorless color may be achieved, as well as fancy colors such as yellow and green. Furthermore if radiation is combined with the process pink colored diamonds can also be produced. How has this affected the jewelry industry? HPHT treatment of diamonds first went public in 1999 and it has been a source of anxiety in the gem industry ever since. This trepidation increased after GIA (which has included HPHT testing in their grading since about 2006) released a pivotal statement in 2010 revealing that they had been receiving large numbers of HPHT treated diamonds ranging from 3 to 20 carats in size. The mining industry has also seen a surge in the sales of type IIA brown diamonds with prices steadily escalating as buyers attempt to estimate gains from treatment. The most concerning area has become the increasing number of treated and CVD (lab created diamonds) melee stones (melee is a term to describe small diamonds that range from 0.18 carats down to 0.001 carats) being sold in parcels with natural diamonds. Their small size indicates an increased need for testing of smaller diamonds, as well as the necessity for non-laboratory testing becoming available and affordable for gemologists as an additional line of defense for the consumer. What is the overall opinion of the HPHT treated diamonds and what does this mean for you? Consumers must be aware that sellers of these stones are required by law to inform them of this treatment as well as any other treatment performed on diamonds (and any other gemstones as well). On the side of the producers of this product they see no difference in the treated and the natural diamond. As mentioned it is a permanent treatment that mimics the natural forces that create a diamond in the earth, however the gemstone and jewelry industry views this quite differently. Natural stones, those that exist without treatments of any kind have always fetched a higher premium. Why? The simple answer is rarity. HPHT treated stones are considered to null and void the rarity aspect. There are a few major issues that face the consumer: first generally the price of HPHT treated diamonds is lower than untreated diamonds, however this may differ from dealer to dealer as there is currently little regulation. Second, when it comes to appraising HPHT treated diamonds this must be taken into account. Since the stone is no longer in it’s natural form and we have no way of knowing it’s previous form many appraisers will have to look the the market for comparables to provide an accurate insurance or fair market value. Larger stones 0.75 carat and up) should be evaluated by a gemological laboratory to confirm that the stone has not been treated. Third, if the consumer is considering a diamond as an investment, or even as an heirloom they must realize that over time a natural untreated diamond will continue to hold and in my personal estimation will gain value over time the same way that natural colored stones have. © GIA A diamond before and after HPHT treatment. HPHT treated stones may not hold their value as well as natural diamonds over time. Disclosure on the part of the seller is required by law. If there's any question you have the right to have the stone examined by a gemological laboratory like GIA. If you have questions ask an independent gemologist! Independent gemologists have no ties to a jewelry stores and are not selling gemstones or jewelry. We are here to help advise you and educate you.